Each forest spa cottage set 100m apart to capture the spirit of romance and tranquility. 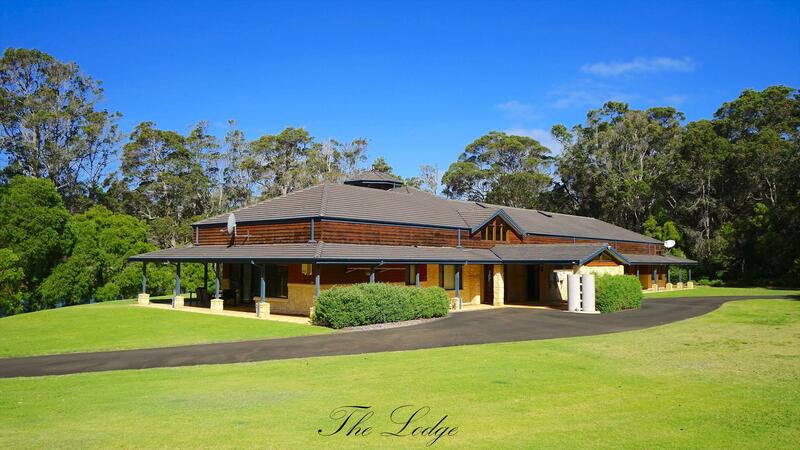 Margaret River's premier forest retreat offers unparalleled privacy and seclusion. 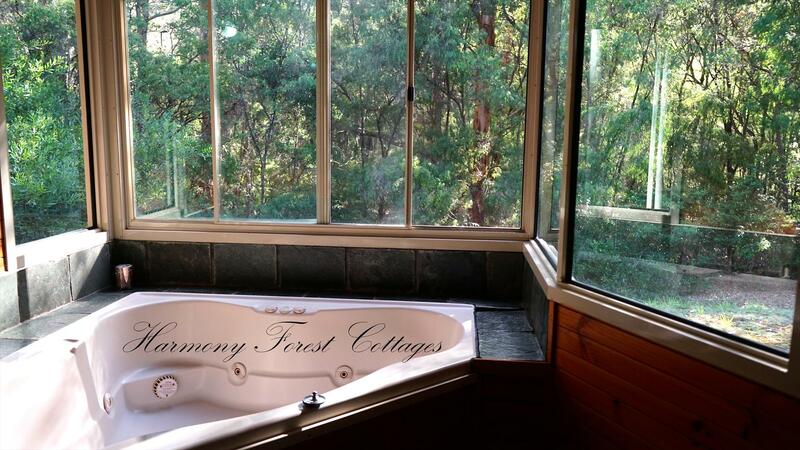 Delight in the captivating views of the forest from your fresh water spa set in it's own sauna style room. Try our fantastic Private Select Merlot which is drinking beautifully in 2012, and available only to guests of Harmony Forest. Complimentary spa bubbles, toiletries and welcome chocolates to spoil you. Electric blankets and potbelly stove to keep you cosy in winter, inbuilt dvd player and cd/ipod dock plus much more is provided. 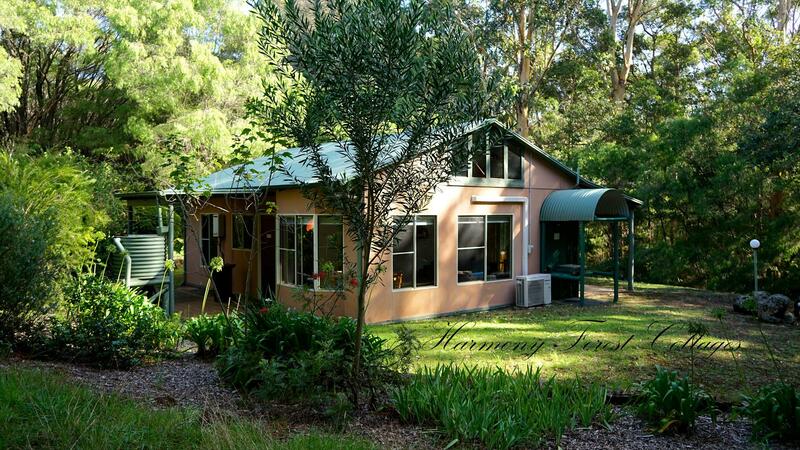 Marsupials and brilliant birdlife abound in our genuine karri forest setting. Amble through our vineyard or treat yourself to an invigorating forest walk as the perfect complement to the indulgent pampering of your bubbling spa. A large private twin spa complements the seclusion and privacy of the forest surrounds. Large windows in the lounge and dining bring the outdoors to you. Enjoy cooking and dining alfresco with own kitchen facilities. Bedding options are two queen beds or one queen bed in main room and 2 singles in the second bedroom. A breathtaking Executive Home oozes complete Luxury. 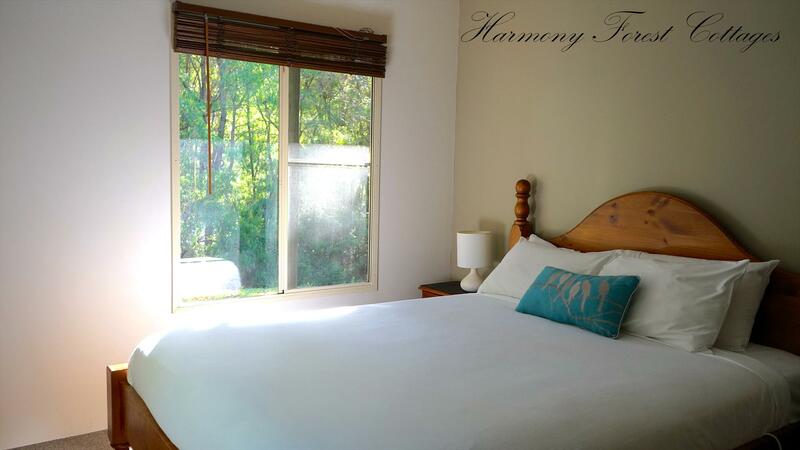 It is a tranquil and secluded home positioned opposite our very own Harmony Lake. The Home provides total convenience and style with plenty of space to relax and unwind. The Luxury Home has 5 bedrooms consisting of a very large King Bedroom with spa bath, large walk in robe and its own lounge retreat. At the opposite end of the home there are 3 x queen bedrooms all with their own bathroom/spa/toilet. The fifth room has 2 x single beds, walk in robe and room to add an extra double bed. Laundry has toilet, shower, washing machine and clothes dryer. The home has a very large chefs kitchen overlooking a spacious open living area with a wooden potbelly heater. This Luxury home is suitable for Couples, Families, Group bookings, Conferences and Intimate Weddings. Portacots and highchairs are available at an extra added cost. ( Please speak to our office regarding cost.) There is a refundable bond charged on top of booking. We reserve the right to allocate you another cottage should that be necessary. Our broad cancellation policy seeks no benefit from cancellations but no loss either. In practical terms that means a refund will be made equal to the amount received from re-letting the cottage for the cancelled period. If at the date of cancellation there is another cottage vacant for the cancelled period then a full refund will be made. There is an expectation that the cottage will be left clean and tidy. If not complied with a charge may be made for extra cleaning costs.